July 1st, 2016 marks two years since my sister, Briana, died. It’s surreal to write those words. I promised myself that I would post a piece of writing either about, or inspired by, my sister annually on this date. It is this commitment I honor forthwith. The grieving process is something that does not end. It’s just not that simple, though I, and others I’m sure, wish it were. It’s akin to the aging process, meaning that we cannot stop it; we must accept it and embrace it as a part of our life. Death, in fact, is as much a part of our lives as life itself. I’ve grown a great deal over the past two years, largely due to the tragic and untimely, passing of Briana. The notion that heartbreaking events put one’s life in perspective is accurate. I have dedicated the past decade of my life to pursuing my dream of making movies. This dedication moved me to Los Angeles, over three thousand miles away from my family, away from my friends, away from my sister. I rarely saw Briana these past ten years, and when I did see her, she was so numbed by drugs in an effort to shield herself from the debilitating effects of her borderline personality disorder that our reunions were limited, disconnected and generally worrisome. If there’s one thing in life I fear most, it is regret that I fear. Regret is something that terrifies me—will I find myself on my deathbed regretting the choices I made during my tenure in this life? Regret, as both a literary and cinematic theme, consistently weaves its way through my work. It is, perhaps, a bit of an obsession, as any decent artistic theme should be, really. It is also obsession that brought me here to LA in the first place; it is obsession that has fueled my filmmaking pursuits. My sister and I both shared a love for movies. 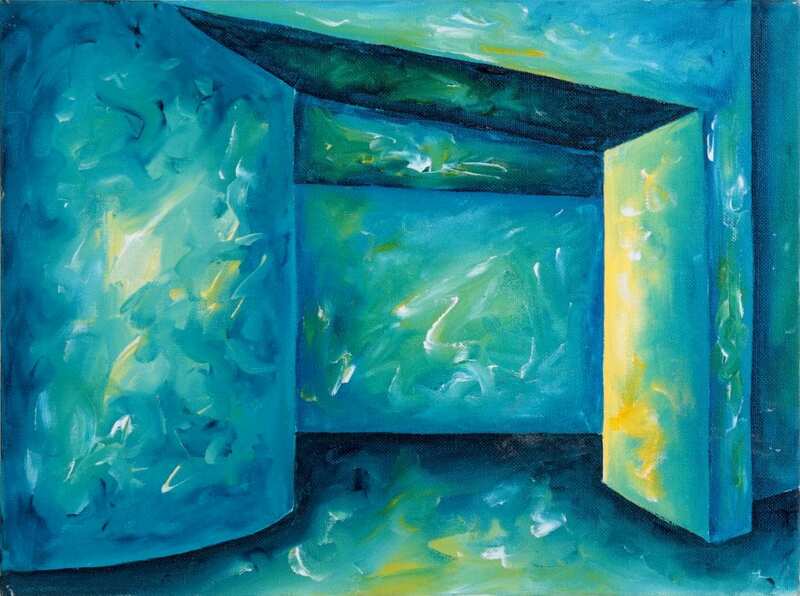 While I decided to pursue movies as my artistic outlet, she decided to pursue painting, and one of my favorite pieces she created is a triptych of movie theater entrances—those ubiquitous square portals that exist inside a variety of multiplexes worldwide. Movies were, and continue to be, important to my family—the shared experience of going to the movies and watching these emotional rollercoasters on the big screen together and reacting to them collectively, has had a profound effect on me. Briana had a terrific laugh, and we shared many laughs together at the movies (not to mention countless laughs when we both discovered “Da Ali G Show” back in the day). That is why this particular painting—or, rather, three paintings—holds a great deal of meaning for me, and why it hangs on my wall today. The entrance to a movie theater is a magical thing: it’s like the door to a spaceship that transports you to worlds you could never fathom existed in other people’s minds. You proceed down a carpeted hallway, within which the unmistakable smell of buttered popcorn wafts through the air, to a succession of doorways, each entrance identical except for the glowing title of the movie that occupies the cavernous room beyond the door that week. Once you sit down in that plush seat, and the light of the projector illuminates itself above you, you are instantly whisked away to an endless number of worlds that stand immune to imaginative limitations. I am in a business where imaginative limitations are something I stand firmly against. This distaste for such limitations extends to my personal life, particularly in light of the fact that my sister is no longer with us—you see, she is still with us, and it is because of memory and imagination that she is. Behind each of the doors she painted, projects a piece of her life. I have become the impression that’s perceived by my sister, or that’s how I’d like to be remembered, if given the choice. However Bridget remembers me. The extent of my existence, the part of me that remains and makes a difference, is captured in the colors she uses to paint me on the canvas in her head. And I hope she continues to paint. It has been difficult for me to regain my focus on filmmaking. Part of the point of my novel was to demonstrate to my sister—while she was still with us—just how devastating it would be to lose a sibling through the realization of how important that sibling relationship is to the characters post-death. In a manner of speaking, the relationship I have with my sister today, post-death, has become more important to me than ever. Briana has become the impression that’s perceived by me. The extent of her existence, the part of her that remains and makes a difference, is captured in the light I use to project her onto the screen in my head. I’ve made it my mission to use my craft, the craft my sister and I held dear, and every resource I have at my disposal—through both my own means and the goodwill of others—to capture her spirit on film, the film based on my novel, which was inspired by her life. The film is “No Alternative” and I have no alternative but to make it.